The great thing about flying is the opportunity, even on commercial passenger flights, is the opportunity to get so interesting aerial photos of some classic sea kayaking areas. Photographs which will either re-kindle memories of great days spent on the water or stimulate thoughts of future trips. So next time you find yourself next to the window on a flight, keep your fingers crossed for clear skies and sit back and enjoy one of the best free shows available. Take off on a clear February afternoon gave these superb views of Jersey. So many great kayaking trips are contained within this photograph, particularly the north west corner of the island. Passing over the east coast of Greenland en route to Copenhagen. Still haven’t managed to paddle on the east coast despite plenty of visits to the west coast. Flying back from Greenland we were fortunate enough to have really clear views of most of Iceland. On approach to Gatwick you normally get good views of the south coast of England, including Brighton. Its been quite a few years since I last paddled off the Sussex coast. Flying south from Belize City. A fascinating stretch of coast but the better sea kayaking in Belize is offshore. In 1993 we paddled over 300 miles along the west coast of Greenland, from Sisimiut to Ilulissat. 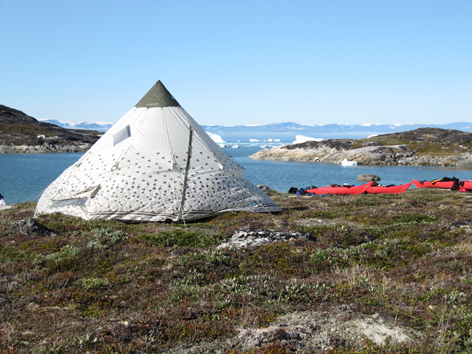 After several weeks paddling we called in at Qasigiannguit, in the south east corner of Disko Bay. Formerly known as Christianshab, the town was established in 1734, making it the second oldest town in Greenland. It is situated in the heart of a rich archaeological region so not surprisingly there is an interesting museum. At the museum there was a traditional kayak and in conversation with the curator we asked if there were still any people hunting in the traditional fashion. He replied that possibly there were still traditional hunters around Thule, in the far north, but certainly not in the area that we were paddling in. It came as a complete surprise, therefore to encounter this Greenland hunter two days later in the ice, on the southern side of Ilulissat icefjord. He was paddling up into the ice and then drifting back on the melt water current occasionally shooting a seal. This is a scene from 1993 which I doubt exists today, certainly in visits to the area since 2008 there have been no similar encounters. Having visited Greenland on a number of occasions and paddled close to 1,500 nautical miles along the west coast, there are a few bits of pertinent information, which I have picked up along the way and might prove useful to anybody contemplating a visit to these northern waters. Buy all of your food when you arrive. It is a waste of time and money shipping food. Even the smallest villages have a shop where you are able to buy anything from cream cheese to a sewing machine. Ilulissat has a number of well stocked supermarkets, which can meet all your needs prior to heading out kayaking. Shop in Saqqaq, northern Disko Bay. Take a spare in case you mis-place your first one. Have it ready to put on as soon as you get off the water. You may not need it but like a good Boy Scout be prepared. Remember to remove it when cooking in case the stove flares up, the molten material could make a real mess of somebodies face. 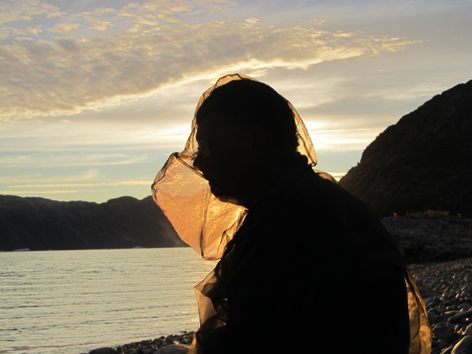 Some people use a complete bug suit, not just a head net. Although it can be a bit of a pain to carry they are a great piece of group equipment. Perfect for those rare days when the weather isn’t good enough to sit outside and ideal for providing some relief when the insects are particularly troublesome. You can end up spending a significant amount of money on a tipi but I bought a cheaper version in 2009 and it is still going strong. 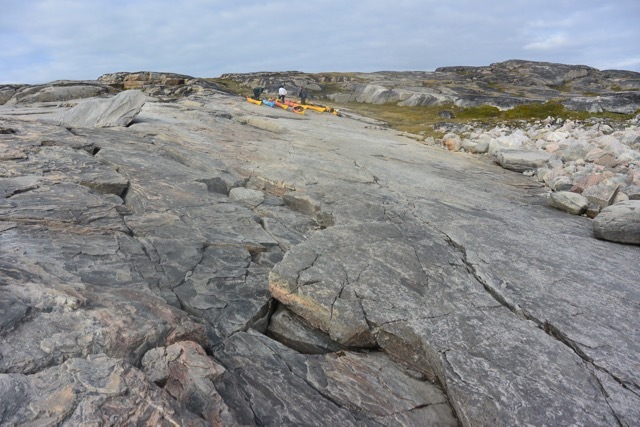 It can have a significant impact on your luggage allowance so I have left mine in Ilulissat, ready for my next visit. Perfect for helping with fuel economy, bring the rice to the boil and then take it off the flame for between 8 and 10 minutes. The rice will be cooked to perfection. They are Ideal for most meals. It takes a bit of searching to find one with small enough handles that it goes into a kayak hatch, we eventually found a suitable one in a back street in Istanbul. Look for the those slabs which have been scoured by the ice, close to the waters edge. They are perfect at lunch time for relaxing on and hopefully there will be no standing water nearby, which will reduce the insect menace. 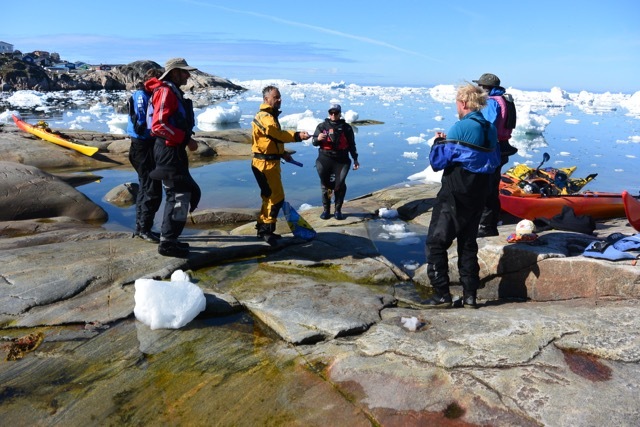 Learning to relax on granite slabs is an essential skill for paddling in the Arctic. The absolute essential item of dry land equipment. Don’t leave home without one. Don’t always paddle to the rear of the bay, when kayaking in Greenland. 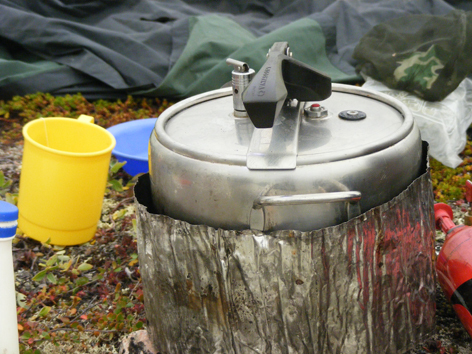 Think about collecting plenty of water during the course of the day and camp on a low headland. The location may be more exposed to wind, which will keep the insects down and the views are likely to be far more spectacular. This was something which Greenlanders have known about for hundreds of years because quite a few of the low headlands we stopped at had indications of previous habitation. A memorable campsite just the north of the abandoned village of Agpat. There was no standing water nearby and we had a relatively insect free evening. It was all so straightforward. Paddle out of Pakitsoq, camp on the slabs at Anoritoq, have an evening meal in Oqaatsut and been in Ilulissat in time for lunch. It just about went to plan apart from the evening meal bit. Leaving the inner part of Pakitsoq. It was pretty important to make sure that we left around slack water. There was no rush in the morning as our calculations indicated that the best time to pass through the narrows was at around 10.30, on this particular morning high water at Ilulissat was at 09.38. It turned out that our calculations were pretty accurate and although we needed to do a bit of ferry gliding we escaped into the outer part of the fjord with very little effort. There were a few intermediate size icebergs around but very little in the way of small ice, which might impede our paddling. This large arch caused some concern as it looked pretty unstable. Although there had been a few indications that the arch was unstable it still came as a complete shock when it collapsed. There is no doubt that if you had been paddling underneath it you would have been killed. Total proof that those pictures where you see kayaker’s sitting underneath an arch are completely foolhardy. Our campsite for the evening was close to the slabs at Anoritoq, which is probably my favourite place to stay along this section of coast. An easy landing, plenty of flat space for tents, a great stream and a never ending range of glacial features to explore. Sheltering from the wind whilst preparing food. eventually we had to move as the wind increased significantly in speed. One of the significant developments in recent years has been the use of more electrical equipment whilst out on trips but the current range of solar chargers means that keeping things topped up is pretty simple. All you need is sunshine. The following morning the wind was blowing offshore and packing up was put on a temporary hold. A temporary hold, which stretched in 22 hours. Bit by bit the wind increased in strength until it was blowing offshore at about 50 mph. There was clearly no way we were paddling in those conditions. The consequence was that we had to miss out on our stop in Oqaatsut, and were still quite concerned about the possibility of strong winds but when we got up at 05.00 the storm of the day before had abated, so in perfectly calm conditions we headed south for the 13 miles back to Ilulissat. On the final day of our 19 day trip we woke to calm conditions and limited ice so we made quick progress towards our final destination, Ilulissat. Landing just after 11.00, we unloaded our kayaks for the final time, we had been out for 19 days. At times strong winds created challenging conditions but our journey through northern Disko Bay had been truly memorable. The east coast of Arve Prinsens Ejland is a truly spectacular stretch of coast but it requires detailed examination of the maps to truly appreciate the height of the cliffs. Usually they are viewed from the coast opposite when heading north from Ilulissat. In places they rise almost vertically for about 2,000 feet, a feature which is clearly going to attract kayakers. At first the cliffs were not unlike other areas that we have paddled, in size, but as we headed north the scale shifted significantly. The size of the cliffs alters your perception so at times you thought I’ll just nip across this inlet. That inlet could be several miles across so if you are not careful you find yourself paddling offshore for an hour or so, rather than exploring the base of the cliffs, which was the focus for the day. At first the cliffs were more like slabs, but still 1,000 feet high. I had only paddled these cliffs once before, late one afternoon about 9 years ago, it was memorable but not like this time. Paddling them in the morning ensured that the sun was in the perfect position for highlighting the physical features and accentuating the texture of the rock. We considered stopping for lunch at the base of the cliffs but there was no protection from any potential stone fall, so we took the sensible option and paddled the 3 miles across to the mainland. The lunch spot turned out to be rather pleasant and so we decided to stay there the night, something we were really grateful for as the wind increased significantly overnight and we ended up remaining there the following day. I have visited Greenland regularly in the last 25 years but this summer was without doubt the most unsettled weather wise. We lost 2 whole days due to strong winds plus had several late starts or early finishes. Other years I have been able to complete a 3 week kayaking trip without having to modify our plans because of unsettled weather. Although today’s paddling had been spectacular it had been rather short, about 13 miles and so after lunch I took advantage of the sheltered bay to practice some rolling. Although we didn’t see any other kayakers this year on previous trips we had always seen other paddlers and I was amazed to see people not wearing dry suits. Many of the French, in particular, seem to avoid wearing dry suits, something which I consider to be rather irresponsible considering the water temperature and potential survival times. I did one roll, no problem, on my second roll I exclaimed about the pain in my head and after my third roll I was unable to speak and needed to hold my head. It was difficult to understand just what it would be like if you were in the water for any length of time. Once I had warmed my head and hands I thought a re-entry and roll would be a good idea, I am not sure anybody else thought it was. I was pretty quick and wearing a dry suit but I still found it rather challenging temperature wise, swimming after a capsize without wearing a dry suit just doesn’t bear thinking about. For me the highlight of the campsite was a father friendly Arctic Fox cub, it didn’t seem in the least bit concerned by our presence. Returning several times during the time we spent at the campsite, clearly ignoring the advice of its parents who were calling from the hillside above. I just hope that he makes it through its first winter. The fox was close I had to move back so that the camera could focus. The following morning the calm of the previous day had been replaced by a significant wind blowing from the south, we clearly weren’t going anywhere soon. One of the tings that has improved in the last few years off the west coast of Greenland has been the mobile phone coverage. Although rarely have a signal when you land, walk uphill a bit and you can be quite lucky. Just remember to brief friends or relatives about what information you need in a forecast before you leave. A half mile walk put us in a position where we could get a faint signal and the information that we received back was all very positive. Light winds, no rain and reasonable temperatures until we arrived back in Ilulissat. As we settled do we for the night little did we realise just how wrong that forecast was to be. The sun might be shining but it was still a cold evening meal. The hoped for settled weather failed to materialise and we woke to a day virtually without colour. Low grey skies, settled on a the grey screen covered hillsides and were reflected in the grey sea. Somehow packing in those conditions seems to take longer but we still managed to be on the water just before 09.00. As we set off from Agpat there was very little colour in the landscape. Heading out from the shelter of the islands we picked up a slight northerly wind, which certainly assisted our journey south. The ice bergs were largely offshore so we were able to relax. At one point we did have a couple of whales submerge about 100 metres directly ahead of us only to resurface behind, you hope that they are aware of your presence but I am never too sure. Louis looking as if he might have left his kayak behind. The slight chop was produced by a following wind so we made excellent progress south. As we paddled south there were a few small icebergs but they didn”t really pose a challenge to navigation. Landings along this section of coast are few and far between so we didn’t have lunch until we had finished at the end of the day. The relatively early finish meant that we were able to make full use of the substantial stream to wash both ourselves and equipment before having time to walk up the large valley behind the campsite. This probably the best landing on the west coast of Arve Prinsens Ejland. Gently shelving beach, a swift flowing stream and a good campsite. Walking up the valley behind the camp site allowed us to see a whole range of glacial features. There is something exciting about wandering across terminal moraines, identifying a roche moutonnee and pointing out hanging valleys. Having a basic understanding of glacial processes can only add to the enjoyment of your time in such a spectacular environment. The wind was still blowing relatively briskly which meant that all of these activities were an insect free experience. Something which had been all too rare so far on the trip. We woke to find that the grey skies of the day before had been replaced by a virtually cloudless sky, unfortunately the wind had increased somewhat and the waters on the outside of the bay were flecked with white horses. We obviously weren’t going anywhere straight away, so we had an enforced, relaxing morning waiting for the wind drop, which it did just after lunch. Soon we were heading south before rounding the southern tip of the island. The plan was to paddle under the huge cliffs of the east coast the following day. A couple of miles along the east coast we found some ideal slabs, suitable for landing on with flat land for camping on behind. Perfect. The only thing that could make it better was a couple of whales, whilst we ate our evening meal. As it was we only had one humpback whale but what a spectacle we experienced for over an hour. It is evenings and days like this that make you realise why sea kayaking in Greenland is such a special experience. The rocky slabs are a great place for lunches and evening meals. Easy to land on and generally with less insects. A whale surfacing in the bay, it provided a real distraction to the evening meal. The whale was feeding so it kept breaching mouth first. A really spectacular sight. The day after we were forced to change our route in northern Disko Bay we headed west along the north coast of Arve-Prinsens Ejland. Passing between the ice to the north and the cliffs to the south, there was no real prospect of an easy landing, I always think that this a challenging stretch of water. As we passed through the narrow gap to the west of Arve Prinsens Ejland we caught a glimpse of our first Arctic Fox. This is one of two land mammals that you might see whilst paddling in this area. The other is the Arctic Hare, which we encountered a couple of days later. Once inside the gap it is advisable to stop, there is a nice sheltered beach and its probably been at least 3 hours since you have been able to have a toilet stop. After lunch a quick scramble up the slopes behind the beach gives you a good view across to the small settlement of Qeqertaq and it is possible to assess the ice conditions for the crossing of the fjord. More importantly there is a really good mobile phone signal, which is great for checking in with home after 7 days out but also enables you to get a reasonable weather forecast. We have used Weather Underground, on recent trips and have found it to be pretty accurate. Oqaatsoq, is the smaller island to the west of Arve Prinsens Ejland, and there is delightful campsite in a small bay on the south east corner of the island. There are some dramatic bird cliffs on the opposite side of the bay to the camp and we have seen whales on a regular basis. What better place to pass some time. We camped for two nights, with some of us paddling the 13 nm around the island, with empty kayaks. A real pleasure. What we saw to the north though didn’t inspire confidence for the future, substantial numbers of large bergs appeared to be blocking the route to Saqqaq, where we planned to replenish our food supplies. The future looked uncertain but there was nothing we could do as we retreated to the tents with a possible storm approaching across Disko Bay. Kayaking along the the northern shore of Arve-Prinsens Ejland. The cliffs on the opposite shore rise to over 700 metres. The narrow gap to the west of Arve Prinsens Ejland leads into this sheltered bay. 2 minutes walk from this beach it was possible to get a mobile phone signal and so our first weather forecast for 6 days. Kayaking along the base of such steep, rocky slabs is always inspiring. The scale is always difficult to grasp. Thousands of pairs of Kittiwakes cling precariously to the cliffs in the bay. Sometimes you are really fortunate, when staring out to sea, a whale will enter the bay. The first indication is normally the sound of their breathing. Storm clouds gathering over Disko Island. Fortunately it didn’t develop into anything serious. After a couple of days on any trip you start to settle into a daily routine. The start of our day had the simple mantra “7-8-9”. Up at 07.00, breakfast at 08.00 and on the water by 09.00. By the time we had arrived in northern Disko Bay, the routine was well established and most mornings we were away early. Entering the waters of entering these waters is always an unknown, as regards ice. It is possible to obtain sea ice charts from the Danish Meteorological Institute but by the time you have kayaked to northern Disko Bay from Ilulissat they are likely to be out of date. If you encounter open water no problem but if there is ice it is matter of feeling your way forward and this may involve getting of the kayaks at times, climbing to higher viewpoint to scout for leads in the ice. In the northern part of Disko Bay there are a number of glaciers which discharge into the fjords so it is impossible to predict how much ice there will be. What is important is to ensure that you maintain a safe distance between yourself and the ice front. The closest we approached was 3 nautical miles and we didn’t hang about! On our journey through the area there were some significant areas of open water but in one place our intended route was blocked so we took a more southerly route. This actually worked out really well as we ended up camping in a delightful spot at the rear of sheltered bay. Our only concern was that in the distance we could see a number of really large bergs, which might have an impact on our need to reach Saqqaq, where we planned to replenish our supplies. There are 2 small settlements in the northern part of Disko Bay, Saqqaq and Qeqertaq, both of which provide the opportunity to buy food, what was uncertain was which one it would be. 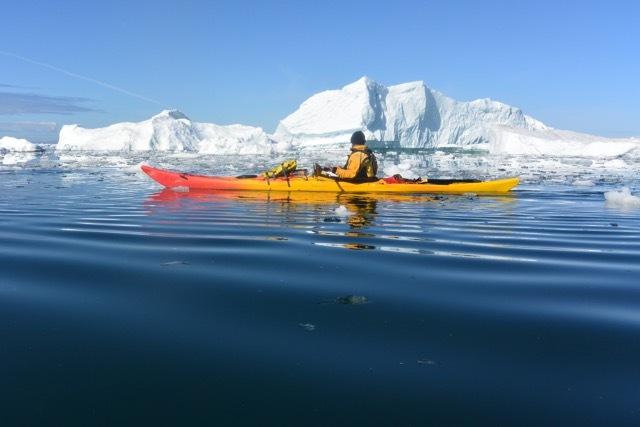 As with any sea kayaking in Disko Bay there is a need to remain flexible due to the variations in the weather and ice. We stopped here to collect our water for the next 24 hours. An early start to the day meant that in the evenings there was plenty of time to explore the surrounding area. This was the last day that the midnight sun was going to be visible at this latitude so it was inevitable that we stayed up to take photographs. Although spectacular where glaciers enter the sea are not safe places to be so we kept our distance. The glacier close to Eqi. The shattered and heavily crevassed front clearly shows why you need to keep your distance. The closest we approached was about 5 miles. At first the ice is really easy to paddle through. The small pieces crashing harmlessly along the side of the kayaks. Gradually the density of the ice increased and at times the way forward wasn’t always clear. We stopped for lunch on these rocks in an attempt to keep away from the insects. We were also able to walk up a small hill which showed that our proposed route in the afternoon was blocked by ice. After lunch a slight change in direction took us back into open water and much easier paddling. This sheltered campsite was a delightful place to stop. 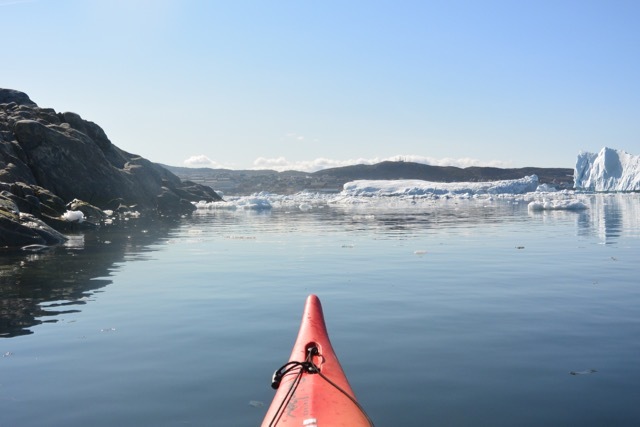 July, saw a return visit to Greenland for 19 days kayaking with the Jersey Canoe Club. The Club is fortunate that it has 8 kayaks in Ilulissat, the main town in Disko Bay, on the west coast. This means that the logistics of paddling in this area are relatively straightforward. 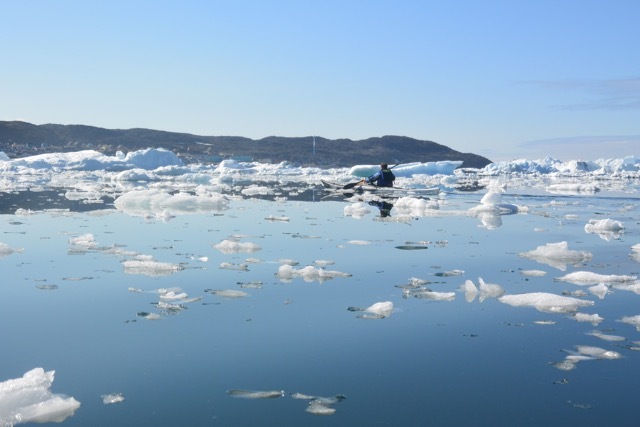 Book a flight, go to the supermarket in Ilulissat and start part paddling. What a complete contrast to my first visit to Greenland when we had to ship the kayaks out months in advance, plus boxes of food etc. That felt like an expedition, nowadays we go on holiday. On our arrival at the hostel in Ilulissat we met Peter and Sue Bisset, who had used the kayaks before us. Peter runs the “Paddles with an Anas Acuta” blog and it was interesting to hear his description of their 4 weeks out kayaking. The weather had clearly been far more unsettled than normal, which had resulted in some exciting conditions. They experienced several days of snow, which is very unusual for July. It was good to catch up though and to hear of their experiences. Within 24 hours of arriving in Greenland, we had sorted out the equipment, bought food and were heading north. Unfortunately as we headed away from Ilulissat the wind started to increase, which was to become a feature of our paddle north. The first day we had to cut short because of an increasing headwind, although we did manage to do some slightly longer paddles in the following days, which put us back on some sort of schedule. Packing the kayaks always generates some interest amongst the locals. On the first evening it was a bit of a walk to find water but what a stunning location. There were some icebergs in the area but they didn’t really present a problem. The slabs at Anoritoq still showed the remnants of the winter snow. This was the first time I had ever seen snow in this area. A beautiful arch, 30 seconds later it collapsed, showing the potential danger. Stopping for lunch in the warm July sunshine. It also provided an opportunity to fill our water bottles. Sheltered campsite on the third night. Easy landing and just a few pieces of small ice. Your final day on a long trip is always a time of conflicting emotions. We had taken part in a really memorable paddle through some stunning scenery. There was far more ice around than I had experienced on my 5 previous trips in Greenland, which at times had presented a significant challenge and even up until the last we weren’t sure how things were going to go. The French paddlers we had seen a few days earlier had taken 2 days to get out of Ilulissat because of the ice, if we took two days to get in then we would miss our flights home. There was quite a special feeling, this was the conclusion of a project which had started over 2 years earlier. At the Scottish Sea Kayak Symposium in 2013 we came under some pressure to run another event in Jersey in 2014. It was eventually agreed that we would go ahead with the event but the aim was to raise enough funds to be able to buy a number of sea kayaks to place in Greenland, which would be available for the participants at the event to use. Effectively we were aiming to re-invest in the sport. 2015 was the first year that the kayaks were available and they were used for 40 days, which was a successful year from the Jersey Canoe Club’s perspective. We already have bookings for 2016 as well as tentative inquiries for 2017. A successful legacy from the Jersey Sea Kayak Symposium, which will hopefully allow more paddlers to experience the memorable kayaking off the west coast of Greenland. The final morning. We had lifted the kayaks up quite a distance the night before as there were a number of large bergs just offshore and we didn’t want to risk losing the kayaks on the final night. Eric heading south through the ice towards Ilulissat. Our first glimpse of Ilulissat. We were still concerned about whether we would be able to reach the town. There was a significant amount of ice, the only indicator which gave us hope were the number of small boats going past. They had clearly been able to force their way out of the harbour. The last few hundred metres and there was a hint of open water between the ice floes. The final slabs on which we pulled the kayaks. At this point we knew that in 36 hours time we would be on the flights home. The Sea Paddler website has been in existence in various forms since 1996. Initially as a site which provide a large amount of information about general sea kayaking. From about 2008 it functioned as a blog and now the aim is to provide a mixture of the two. The focus was on sea kayaking in Jersey but has expanded into other geographical areas and different activities. Copyright © 2019 Sea Paddler. Powered by WordPress. Theme: Accelerate by ThemeGrill.